Sultry and vivacious, Penny King is a jazz vocalist in the fullest sense of the term, doing a perfect balancing act between vocal improvisation and traditional song delivery. Anyone in need of proof should look no further than her inspired and electrifying rendition of Wayne Shorter’s Footprints, as heard in her album, “Journey”. (No, seriously, go and listen to it, then come back). Her album journey has been a favourite of this site since it went out, a couple of years ago; now the Perth-based singer is about to play at Melbourne’s Paris Cat, in a gig that will see her reunited onstage with the saxophonist accompanying her at the recording, Carl Mackey. All in all, not a bad opportunity for a long-overdue Q & A.
AustralianJazz.net: What are you going to present at the Paris Cat? Penny King: I’m going to be presenting material from my 2013 release ‘Journey‘, which was a finalist for best jazz vocal album at the 2014 Bell Awards. This material includes original compositions as well as arrangements of tunes from Sonny Rollins, James Taylor, Bill Evans and Wayne Shorter. I’ll also be singing some of my favourite tunes and arrangements from composers including Vince Jones and Joni Mitchell, plus a few standards thrown in. So audiences can expect an eclectic mix of material! AJN: What is it that you most enjoy about singing? How would you describe the feeling of being onstage? PK: I feel happiest and most ‘myself’ when I’m singing. An audience member once told me I looked ‘zen’ on stage and that’s pretty much how I feel! I love the fact that it is such an expressive avenue through which to communicate and tell stories. My favourite part of being onstage, in a jazz setting, is the interactions that happen between the band members, the places the music goes, and the aspect of not knowing exactly how the music is going to unfold, which runs along the thin line between fear and exhilaration! AJN: How has your journey into jazz been so far? PK: My journey has been a slow and steady one, beginning with studying jazz at the Western Australian Academy of Performing Arts all the way back in 1995. This was an important turning point for me, and the start of a lifelong musical journey. I feel recording my 2013 album and original material was a great opportunity to document where I was at, musically, at that point in my career. It was certainly a long time coming, but I wanted it to be at the right time and with the right musicians. I was lucky enough to record with musicians that I had developed a relationship with over the past ten years or so, this made the process a comfortable and intuitive one. I feel constantly inspired by the incredible players I get to play with. My greatest challenge is time; I have two young children and I feel that my head is in ten different places at once most of the time! That elusive life-work balance is one I am trying to get on top of, this will always be part of the journey. PK: I went along to a show at the Perth Jazz Society, back when it was at the Hyde Park Hotel in Perth. Until this point, I had dabbled in some amateur musical theatre, and thought this was the way to go for me as I just loved to sing, despite the fact that I had never really fitted completely into that genre. The night at the Hyde park I saw a jazz vocalist, Helen Matthews, and it was a light bulb moment – “that’s what I want to do!”. Jazz singing to me is complete freedom. AJN: When did you realize that you have found your own voice? PK: I think in some ways I’m probably still on the journey of finding my own voice, it’s something that is constantly changing for me as I listen to and experience the ever changing ‘jazz’ landscape, and find inspiration from new sounds and artists. That said, I’ve felt really comfortable with my own style for a while, and certainly when I’m singing my own tunes and arrangements. I think finding a group of musicians that you feel completely supported by, and that you feel comfortable to take risks with is part of finding you own voice, and for me that has been the case for a long while now. I am a fairly technical singer, and this comes through in my teaching as well; it all comes back to solid technique for me, as this allows me to do everything I want to do with my voice. I do really like to work as an instrument and weave between lyric and line, and improvisation. AJN: What are your next steps? PK: My next artistic plans include some more writing and hopefully, recording again in the not too distant future. I am really enjoying revisiting the work of Joni Mitchell at the moment; I presented a show of her music for the Perth International Jazz Festival last year, along with musical director and long time collaborator Tom O’Halloran, and I’m looking forward to presenting this show in my home town of Perth again this year with some fantastic musicians. I would love to tour nationally with some new material sometime soon as well, so stay tuned! AJN: What does jazz mean to you? PK: It’s with me on a daily basis, and jazz to me also means freedom, freedom to be myself and freedom to explore different styles under the jazz banner. Through my teaching, I love that I get to pass on my love of jazz to the next generation. AJN: Do you improvise in life? In which situations? PK: I am a mum to two young children, so my life is all about improvisation! AJN: What is your greatest aspiration? PK: My greatest aspiration is to still be doing this for as long as I can; I feel pretty lucky to have achieved longevity in a niche musical genre so far, in a fairly isolated city, may this continue for as long as I live. PK: Ah this is a hard one… so many! As I prepare to cross the country for my show at the Paris Cat, it’s probably a combination of Joni Mitchell’s ‘Black Crow’ or my own track ‘Journey’. 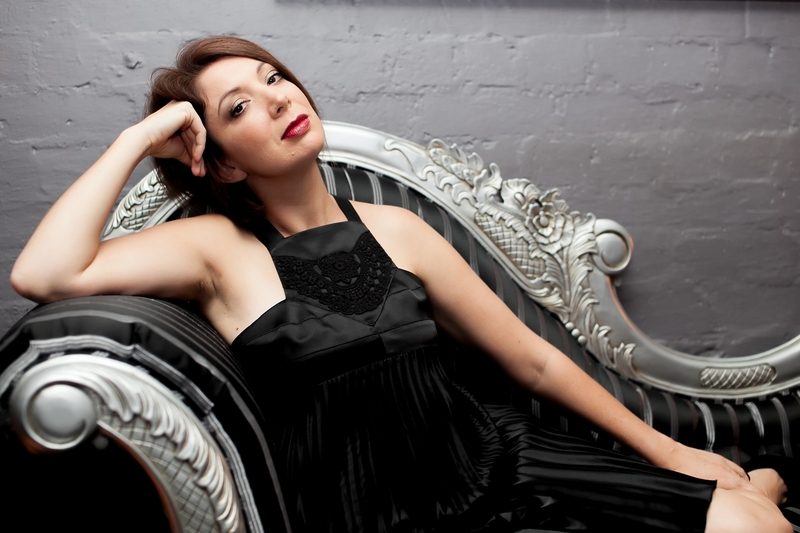 Penny King is making her debut at Melbourne’s Paris Cat on Friday 15 April.